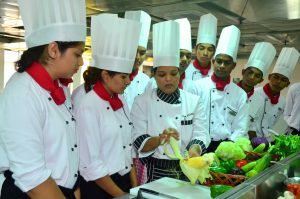 VM Salgaocar Institute of International Hospitality Education (VMSIIHE) is a world class hospitality institute, set up with state-of-the-art infrastructure, and a wide range of facilities. Affiliated to the Goa University, it offers a B.Sc. in International Hospitality Management. The campus, which is situated five kms from Margao, in the idyllic village of Raia in South Goa, is spread over six acres, with additional land reserved for future development. The well designed, state-of-the-art WiFi covered campus has air-conditioned high-tech classrooms, air-conditioned hostels with attached baths, an amphitheatre, a swimming pool and even a fully functional 5-starred training hotel on campus – with a grand lobby area and reception, well-appointed guestrooms, a restaurant, kitchen area and banqueting facilities. The program provides participants with a profound exposure to various facets of the industry, departmental processes related to food & beverage planning, showmanship, front office and housekeeping practices, human resource management and food production operations. It also offers them a leadership programme which inculcates a professional attitude in a holistic learning environment. VMSIIHE is supported by the Marriott Group and the curriculum has been designed under the guidance of senior industry and academic experts and follows along the lines of the best hotel management programs in the world with the aim of producing hotel management professionals and hospitality leaders of the future. The three year full-time program at VMSIIHE is designed to equip the students with practical training and necessary skills, with special attention to personality development, professional attitude and leadership qualities, which are essential to be a global manager of repute. The institute boasts of a unique industry-focused curriculum which includes both academic learning and practical sessions, dedicated and experienced faculty with international expertise, sophisticated equipment, interactions with industry experts, an exchange program to Portugal, a visit to Switzerland, professional internship at starred hotels across India and abroad as well as a 100% placement assurance. On completion of the course they will have the skills to meet challenging opportunities in a dynamic industry and adapt to requirements around the world. The recent tie-up with Turismo de Portugal for an exchange programme will give 10 outstanding students a chance to visit Portugal as a part of the program. The institute also offers its students an opportunity to pursue a post-graduate degree at HTMi Switzerland, a globally sought after hospitality institute. With the strategic partnership with HTMi, students who have successfully completed the 3-year International Hospitality degree at VMSIIHE in Goa will be eligible to be enrolled at the Master’s program at HTMi Switzerland. The duration of this program comprises of one academic semester of taught modules, followed by the completion of a master’s dissertation within six months of the completion of the taught modules. Upon completion students will receive 3 post graduate degrees: A Post-graduation diploma in Hospitality Management, an M.Sc. in hospitality and tourism management, and an MBA in Hospitality Management from HTMi. At this time of the year when students are on a hunt to explore various institutes that will lead them to their desired career, VMSIIHE seems to be the perfect combination of academic learning, practical sessions and professional internships which are designed to give one’s hospitality career a flying start. 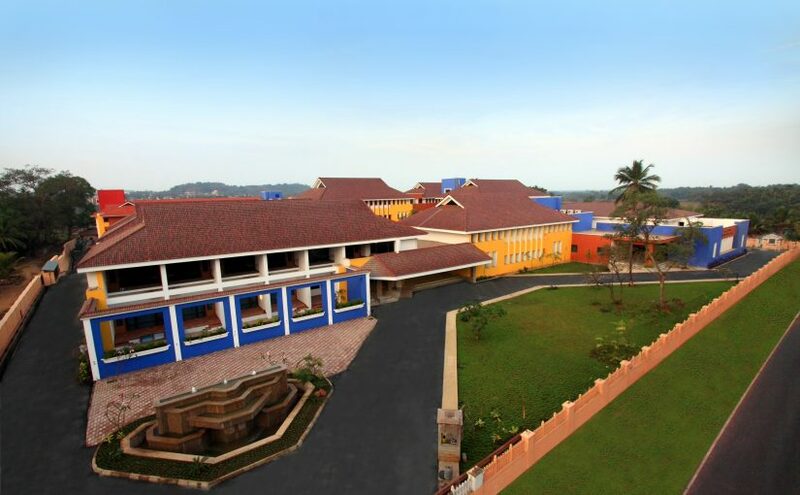 The tranquil campus provides a soothing backdrop for competitive and fun filled learning experiences. The visit to Switzerland, the exchange program and the potential for internships abroad make this is a particularly attractive opportunity for students keen to embark on an international education related adventure. Admissions are now open for the coming academic year 2017–18. Students who have appeared/passed the Class XII board exam in Arts/Commerce/Science/Vocational stream can walk-in for the entrance test at the Institute on any working day from Monday to Friday between 9 a.m. to 4 p.m. But the sooner the better, because candidates admitted on or before May 31, 2017, can avail of an early bird offer which is a 10 per cent concession on tuition fee for all three years at the institute. Their website www.vmsiihe.edu.in provides more details about the program and a more comprehensive look at the institute, staff and features. Previous post: What is Goenkarpon ?